Are you joining us for the 12 Months to a Healthier You Challenge? If so, it’s Friday and guess what that means? It’s time for our weekly check-in to post our progress. We’re focusing on developing the habit of exercising more in January. I encourage you to set a simple and doable goal for exercise and to stick with it. If you haven’t set your January Exercise Goal yet, be sure to do so and then leave a comment on this post telling us what your goal is. New to this challenge? Read more details on the plan for this year here. My goal for January is to consistently exercise at least 5 times per week. 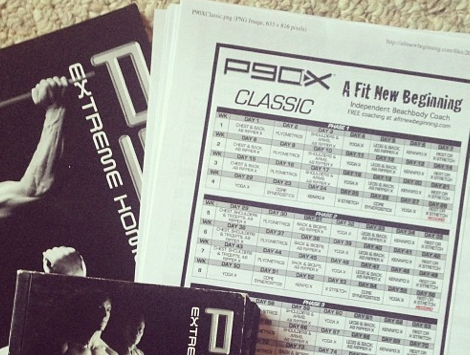 I plan to follow the P90X workout schedule except for the days when I’m traveling/out of town. On those days, I plan to stick with cardio/running. Finally, finally, finally!! I hit my exercise goal this week — yay! Leave a comment telling us how you did on your exercise goals this past week. If you’re blogging about this challenge, leave the direct link to your blog post about the challenge below. Are you on social media? You can also share your progress on , , , or by using hashtag #12MonthstoaHealthierYou. So I didn’t entirely bomb this week like I did last week, but between my book launch and a cold, I only managed to exercise a few times. You may have noticed that I’ve been absent from here this week. That’s because I had a bit of a crazy week… one that didn’t allow time for blogging or exercise. I spent most of the week doing interviews and media meetings in NYC (I’m posting a recap in a bit for those who are interested in getting a peek into my week). So I pretty much bombed my exercise plans. Unless the one mile I ran on the treadmill or all the walking I did in NYC counts. Other than that, I did zero exercise. But I’m going to give myself grace… and get back up on the bandwagon again tomorrow. 🙂 And hopefully I’ll have a much more positive report to share next week. I started P90X on Wednesday. I’ve gone through the program before, but it’s been quite a while and the first day kicked my tail. The second day wasn’t quite as bad. And today (the third day), I actually woke up excited to exercise. In fact, I rolled out of bed, changed into my workout clothes, and started exercising first thing! I’m incredibly encouraged (albeit a bit sore!) because after just three days, I feel stronger and healthier. I am especially thankful because I’ve been feeling somewhat in a funk the past few weeks and I’ve felt so much more energetic the past three days. I really think it has to do with starting my day with strenuous exercise.